Are you interested in building an empire and want to use conventional mortgages? Under current regulation each person can have up to 10 houses per individual name. The myth of only 4 has been heard over the past couple of years. The difference is after 4 houses or 5+ the rules change. 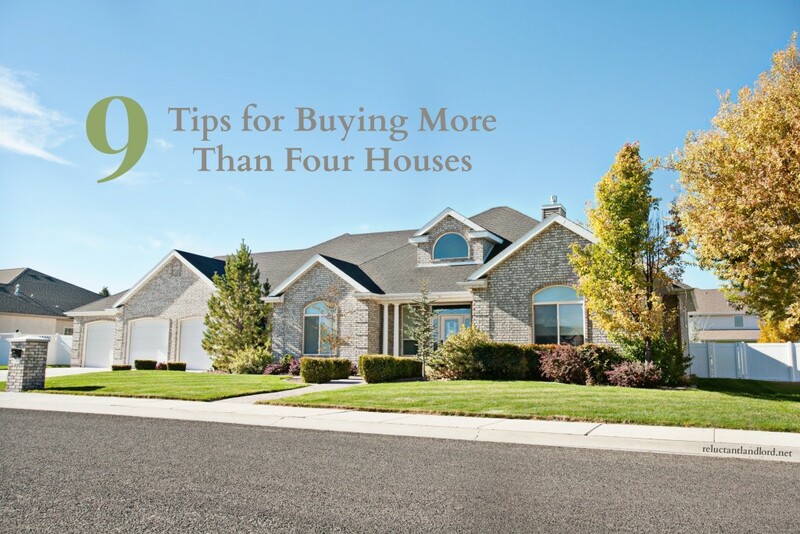 That is not to say you cannot buy more than 4 houses, it just means that things get more complicated. We just bought our 6 and 7th houses. I often times see the question “how” do you buy after 4 homes? While it certainly gets more challenging it is very doable! The key is to understand that the process will be different. Mortgage Number– Against common misconception you can have 10 houses in your name. The key to know is that after 4 that things get harder. They look at your package more closely and in my experience you are labeled as an investor. Therefore you simply go through the fine tooth comb a little finer 😉 We have been successful but it certainly is more challenging. Institution Shopping– There are fewer institutions that will work with you if you have 4 or more mortgages. In our case using a broker becomes even more important than when we only had one or two mortgages. When I was shopping about a year and a half ago before I went back to work none of the banks would directly lend to us but they had no issues buying the loan off my broker. Credit Score– In our experience if you are buying an investment home you must have above a 720. I am not sure if that was because we were above 4 mortgages or just because it was an investment loan. % Down – Once one exceed 4 homes and are buying as an investor, I personally have not found a mortgage broker who performs with less than a 25% down payment. It is one thing if they promise you the world then can’t close. Therefore the burden on funds becomes much greater. Investment Versus Personal – This is a VERY important differentiation. The homes we have purchased above 4 that were PERSONAL homes, i.e. we were going to live in them, were much easier to buy! We had very few issues. You can still use the VA loans. I personally have not found banks that let us do any of there “special” programs but you never know! Reserve Funds– This is the thing that has started to KILL us as young investors. As described here, reserve funds are required once you start having multiple homes. For the houses that we bought as investments we need 6 months of reserve per house for the mortgage, escrow costs and HOA fees. This quickly adds up. Loan Types – In my experience I have not been able to find any loans other than the conventional ones once we reached past 4 as a pure investor. They require you to put 25% down and one qualifies for none of the special programs. Most special programs are for first time home buyers–not investors. Difficulty – As mentioned before the more property you have the harder the acquiring the loan gets. You now need leases on all your properties, more reserve funds, and they just look at every thing MUCH closer. Our last one was the worst ever. They threw out our reserve funds 3 times. It was a mess. We closed it and in the end it was TOTALLY worth it. Just go into this as if it is the “tough” mudder and baby step you way through it and you will be fine 😉 Just be prepared for a challenge. What has been your experience? Have you found something different? Do you have any tips you would like to share? You are spot on for this. I just recently bought my 6th house and everything you said above was exactly true. It is very difficult for investors to get financing if they dont have really good credit and a lot of money in reserves to cover everything. Luckily for you and I, we can do this and we should definitely take full advantage before anything changes. Im concerned about rates going up later this year. I totally agree, the question regarding interest rates is not “if” they will increase but “when”. Due to the low interest rates we are focused on growing as quickly as possible. The key has been to make sure it is sustainable through those ulcer inducing moments, landlording or expansion. As you mentioned even coming from a great financial place, the mortgage process can provide many challenges. i used impactmortgage and ridgelending to refinance and cash out when I bought my fifth eight houses. Thank you for the suggestion. I will definitely have to look into those mortgage brokers. Really good info! I wish I had found your site years ago. I’ve had to learn a lot of this on the go. Though I am not over 4 houses, a lot of this still comes into play. Some that difficulty in gaining a mortgage is due to the actual Fannie Mae guidelines. Thank you! Glad you like the articles!